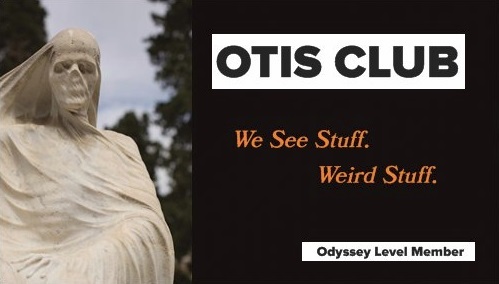 OTIS (Odd Things I've Seen): What Would the Headless Horseman Wear? What Would the Headless Horseman Wear? October 28, 2010 – These days, now that I’m too old to trick-or-treat, the penultimate point of my Halloween is the jack-o-lantern carving. I mean, I love the Halloween specials and the horror movies and the candy and the Autumn activities, but at no other point are you more at one with the Halloween spirit than sticking a shiny Michael Myers knife into thick orange flesh. And even though I’ve been carving pumpkins for decades, I’m always struck by how strange a ritual it is (as are most rituals, I guess). With just a few slices of our kitchen blades, we give both life and death to this giant fruit. We anthropomorphize it with eyes and a nose and a mouth, but by doing so imminently expedite its decay. But that’s kind of the way it is for all of us. The first second of our birth is the first second toward our death. 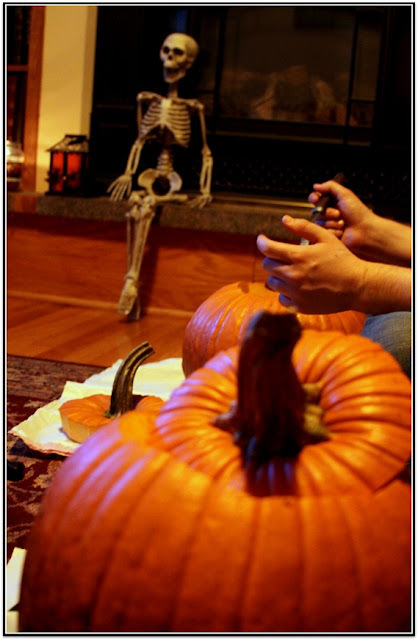 Now that’s Halloween in a pumpkin shell…meditations on death that masquerade as fun family activities. 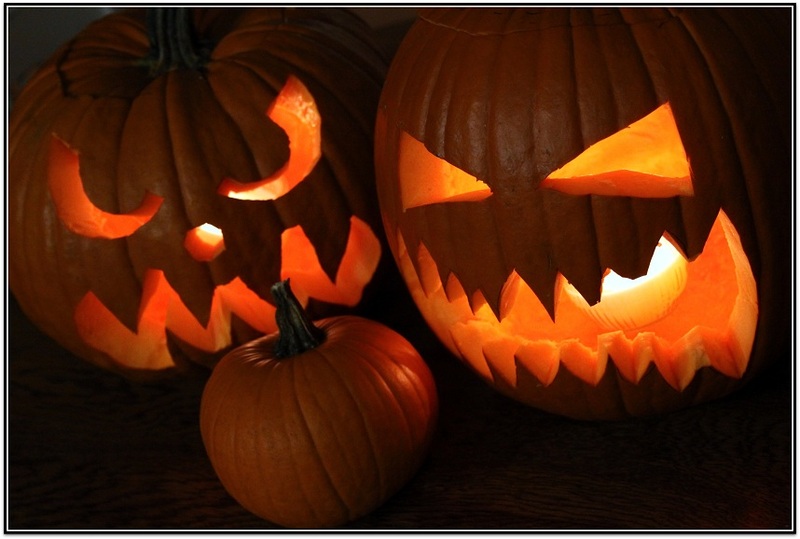 When carving my jack-o-lantern, I follow one simple guideline: What would the headless horseman wear (WWHHW)? Basically, the guideline rules out any kind of “cute” face. It also rules out non-face designs, no matter how Halloween-relevant. Don’t get me wrong, I like all those ghost and witch and haunted house patterns that come in those Pumpkin Masters kits…I just like a little more jack in my personal o-lantern. 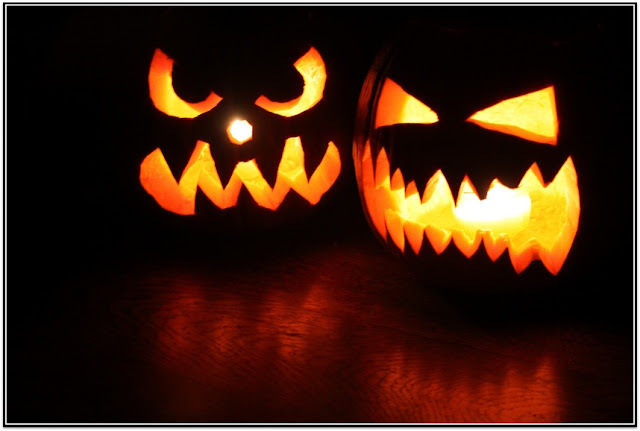 Every year, I also have to fight the urge to carve the classic pumpkin face. You know the one I’m talking about. A pair of upturned equilateral triangle eyes and a matching upturned equilateral triangle nose above a crescent of mouth sparsely filled with square teeth. It’s a comforting face to me, like Santa’s or LeVar Burton’s. But the face I carve eventually goes on to become the face of my Halloween for that year, so it needs to be different from previous years. I’m never quite sure when is the optimum time to carve a pumpkin. Obviously, I want to do it October 1, but the second law of thermodynamics precludes that. I also don’t want to do it the day before or of Halloween, because I want to spend some quality time with it before the neighborhood teenagers disarm its smile against the nearest bit of pavement. And I sure as heck don’t want to be constantly carving pumpkins, either, just so that I’ll have a fresh one around at all times. Generally, that means about a week before Halloween, and then we just put up with the growing smell of rot and slowly collapsing features until its final bow on the stage that is my front porch come October 31. So the other night we threw down some garbage bags on our living floor, littered them with a booby trap of sharp knives and other implements, and popped in a movie as a sort of visual soundtrack to our activity. 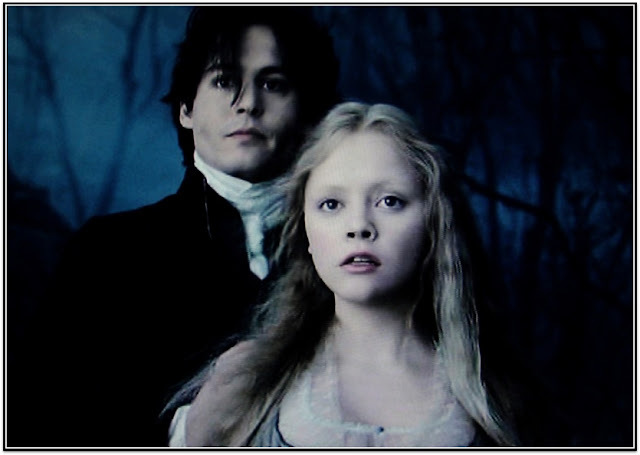 This year, we chose Tim Burton’s Sleepy Hollow. Sleepy Hollow is probably the perfect movie for carving pumpkins to. 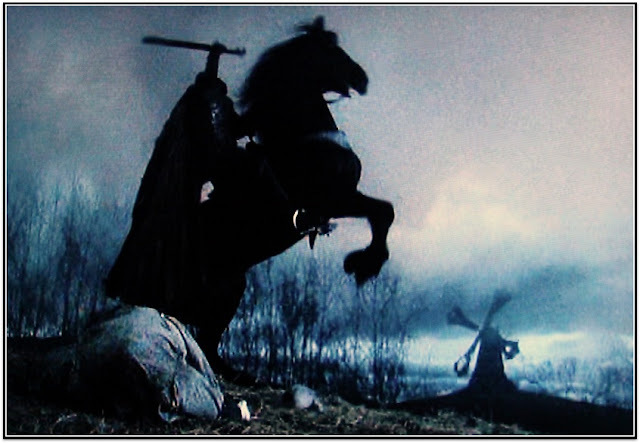 First, because of its subject matter…even though the pumpkin head/missile of the fabled headless horseman is only really alluded to briefly in the movie. Also, because the movie just looks beautifully Halloweenic with its gnarled trees and fog and scarecrows and graveyards, perfect for stray glances in between trying to wrest emotion from a hollow gourd using only sharp angles. Finally, because as much as I dig the movie for its ambiance, the whole storyline is horribly contrived to the point of rubbed foreheads and heavy nose snorts. But that makes the plot easy to ignore, freeing you up to concentrate on not slicing off either your own fingers or your jack-o-lantern’s teeth. It’s a violent thing to make a jack-o-lantern. Think of all the action verbs used to describe it: gut, carve, stab, slice…they’re all serial killer verbs. So while Johnny Depp pranced around the Hudson River Valley spewing horrible dialogue in the face of Christina Ricci back when she was a lot more of an interesting actress, we set to serial killing our pumpkins, wounding faces into their grooved flesh like Dr. Frankenstein raising his monster. 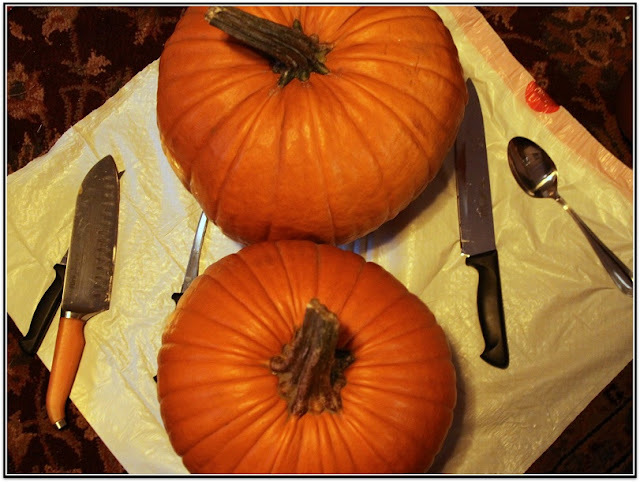 Despite the violence, there were no bad mishaps with either our pumpkins or our cutlery. My wife accidentally blunted a few of her jack-o-lanterns teeth and I had a minor bit of panic at learning that I had drawn the face on the pumpkin hide with permanent marker and that, due to the design, some of it survived the cutting process. It was nothing a bit of Goo Gone couldn’t fix, but if someone would breed a species of dry-erase pumpkins, that might fix a few of my future Halloweens. In the end, we were pretty happy with our pumpkins and ready to put them to use keeping evil spirits away and inviting kids to our candy. I mean, mine didn’t totally turn out the way I wanted, but once you stick in a candle and turn out the lights, even the sloppiest made jack-o-lantern looks awesome. And all before Christopher Walken got his head back. but we're opposed to her messing up a perfectly good pumpkin with her horrible baby coordination. Of course, finishing carving the pumpkin isn’t the last step. We still had our pumpkins’ intended future offspring to roast. We all have our own recipes, I guess, but my secret ingredients for roasted pumpkin seeds, born from my empty-cupboard bachelor days is Old Bay seasoning and port wine. Guess they're just ingredients now, though. The funny thing about eating pumpkin seeds for me is that by the time I get around to this part of the season, my teeth are so sensitive from all the Halloween candy that has scraped across their enamel that it’s actually kind of an ordeal for me to chew them. 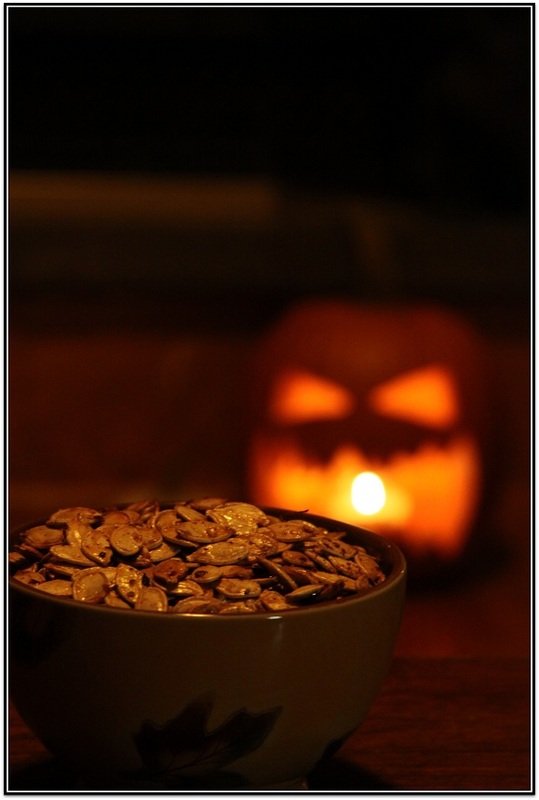 I still love them, though, and that single moment when you sit down with a bowl of warm, salted seeds to watch a movie while your pumpkin glows companionably in the corner, filling the room with the smell of singed pumpkin flesh, is exactly why I get so excited by this time of year.